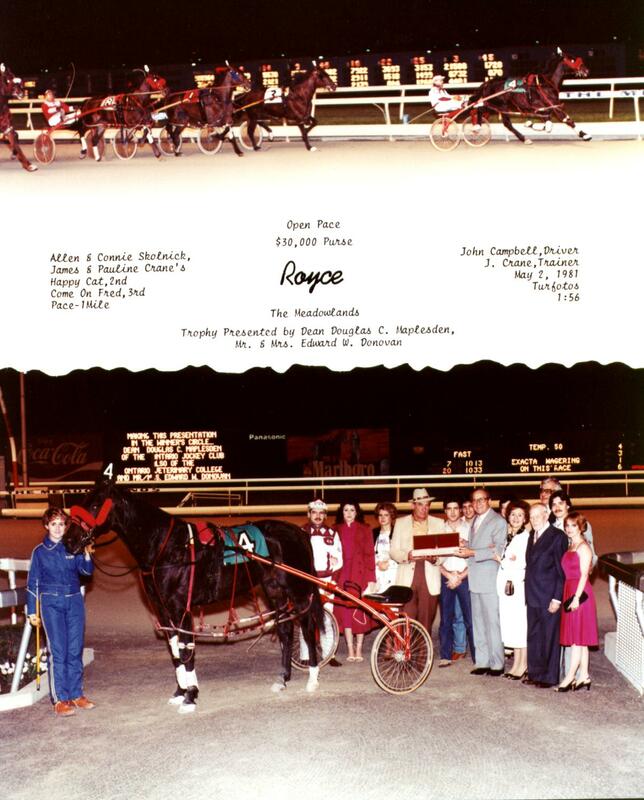 Royce p,4,l:53.4($437,177), one of the leading Free-For- All pacers of 1980-81 and a popular current sire, recently had to be put down at the age of 13 after shattering a bone. Voted the "Aged Pacer Of The Year" at four in 1981 when he amassed $355,256, Royce had been standing his first season at Almahurst Farm's Lambertville, New Jersey, station. Prior to then, he had stood at Almahurst Farm in Lexington, Kentucky for eight years. At the time of his death in May, 1990, Royce had sired the winners of over $10 million, with 133 of them in 2:00 or faster. He sired many top pacers during his short career at stud, including the classy stakes colts Sherman Almahurst p, 3, l:52.3 ($634,221) and Prince Royce p,3,l:53 ($580,033). 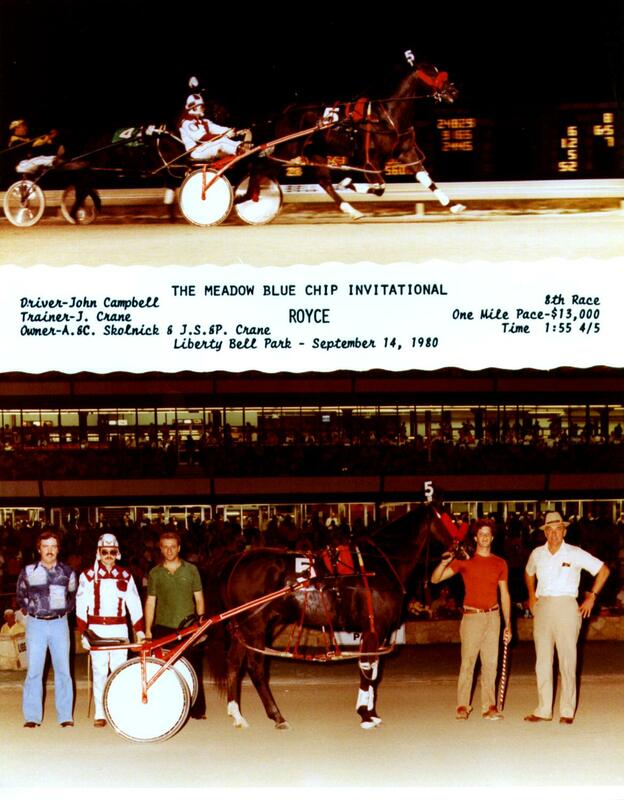 Sherman Almahurst was victorious in the Kentucky Pacing Derby, Peter Haughton Memorial, Potomac Pace, and Greenwood Stakes, while Prince Royce's wins included the Jersey Cup, Garden State Stakes, and a Woodrow Wilson elimination. Royce sired no fewer than 37 1:57 performers and 21 $100,000 winners, including at least ten major stakes* winning fillies and colts. Some of his best progeny, besides Sherman Almahurst and Prince Royce, include Prim Royce p, 1:55.3 ($410,585); Romantic Prince p,4,l 153.4 (1332,076); Merci p,3,l:55.3 ($264,938); Ezra Almahurst p,3,1:56.4 ($262,575); Racy Royce p, 1:52.4; Roycelita p,4,l;53.4; Jaguar Lauxmont p,3,1:54.2; Rollin Royce p,3,1; 54.2; Stacy Almahurst p,2,TI:55.2; Barry Almahurst p,2, 1:56.1; Hunza p,2,1156.4; Royceterous p,2,Tl:57; and Chauffeured Lady p,2,l:57.4h. Bred by Taney Rainbow Farms of Tancytown, Maryland, Royce was owned by Alien and Connie Skolnick and James and Pauline Crane, and was trained by Jim Crane throughout his racing career. His racing slate was 43-19-7-4, or 70 percent firsts, seconds, or thirds against the best pacers in the country. Among Royce's victories were the Canadian Derby, Governor Alfred E. Driscoll Final, and two legs of the Graduate Series. This royally-bred son of Albatross, out of the Tar Heel marc Sulta Rainbow, has a mouth-watering immediate maternal pedigree which includes such recent champions as Beach Towel p,3,l:51.4f-'90 ($1,773,57]); Canvasback Fella p, 4, l:53.2-'90; DC Buena Lobell p,2,l:55.4 ($393,230); Sunburn p,2,1:58.3; Sun Lamp p,4,ll:53.4f; Sunbest Hanover p,2, l:59.2f (1266,595); Suntime Hanover p,3,1:55.2f; Sno Cap p,3,l:56.3; Beach Boy p,l;56.3f; the great New Zealand sire Smooth Hanover, and many others. Royce comes from the maternal family of LIDA, which contains numerous current-day pacing stars like T K's Skipper p,4,1:51 (1715,313); Tyler's Marli p,3,l:51.3 (1289,100); Trenton p,3,l:51.3; Topiiotcher p,4, l:52.2f-'90 (1943,311); Safe Haven p,4,l:52.4-'90; Prince Lee Cam p, 4,1:53.3; Seven O'Clocli p,4,1:53.3 (1559,080); Ahoy Captain p,4,1:53.4- '90 (1379,334); Shiric's Beau p,4, 1:55.1f (1499,010); Careisable p.2, 1:55.4 ($1,006,380); and Banker Frete p,l:56 ($563,007).